For more information about Deerwood real estate, contact the property manager at Baldwin Real Estate, Inc. or (828) 684-3400. 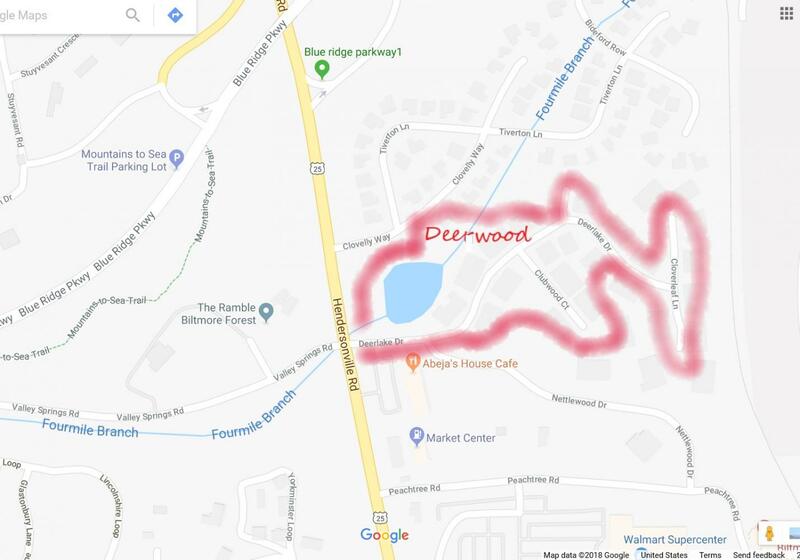 Although the Deerwood Community does not have a specific address on Hendersonville Road, it is located in the city of Asheville on the east side of the road between Devonshire and the Fugazy Center in the 1500 block. It is easily recognized by the small lake, the set-back Deerwood sign, and the Nettlewood Professional Park sign at the corner of Hendersonville Road and Deerlake Drive. Take exit 50 or 50a off I-40 and follow US 25 (Hendersonville Rd.) south 3 miles. Just past the Blue Ridge Parkway, turn left onto Deerlake Dr. at the stoplight (between the small lake and the Nettlewood Professional Park sign) into the Deerwood community. Follow it past the sign into the community. There is no other entrance or exit. Residence numbers are located above the garage doors. Exit I-26 at Long Shoals Rd. at Exit 37 (the next exit north of the Airport exit) and go east about 1.6 miles to US 25. Turn left on US 25 at the Exxon Station and go north about two miles to Deerlake Dr. Past Wal-Mart, turn right onto Deerlake Dr. at the stoplight (between the small lake and the Nettlewood Professional Park sign) into the Deerwood community. Follow it past the sign into the community. There is no other entrance or exit. Residence numbers are located above the garage doors.